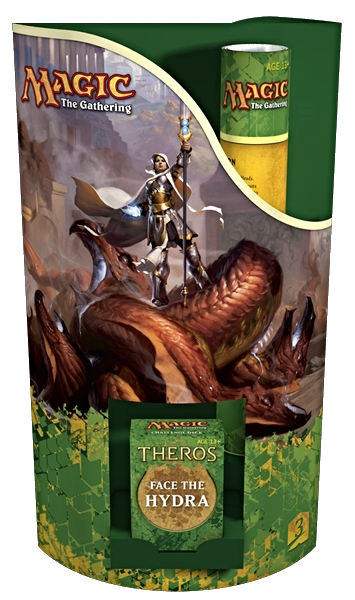 Face the Hydra is a challenge deck used at the Theros Game Day. It's also the name of the third quest of the Hero's Path. The Challenge Deck is a special self-running deck with its own set of rules. Players are encouraged to pilot it against one another one-on-one or in groups of up to four with guidance from the included instructional playmat. The Challenge deck contains 60-cards (18 Heads and 42 Sorcery cards). The 15 unique cards are not legal in regular Magic, which is made clear by their different card back. Some of the Heads have the supertype elite. When playing against this deck the player may use his Hero cards. The Hydra follows a predetermined sequence of casting cards from its shuffled deck and blasting the player for damage. The goal is to eliminate all of the Hydra heads before it eats you. When you cut one head down, sometimes more grow back. If you win against the challenge deck, you win a third Hero card (The Slayer). The Face the Hydra Challenge Deck is available as a saleable product for $11.99. 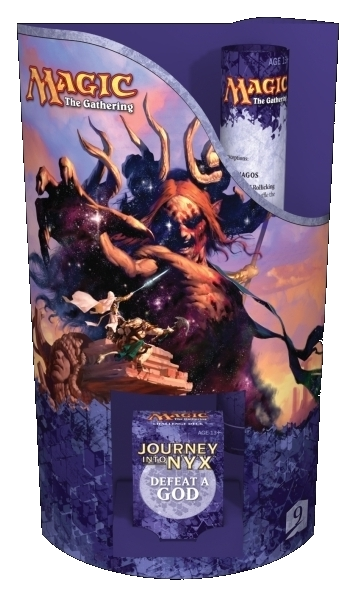 Challenge Deck Box Set Cards were available in ? different languages: English, French, German, Italian, Japanese, Portuguese and Spanish. Korean, Russian, Simplified Chinese and Traditional Chinese languages are not confirmed yet. 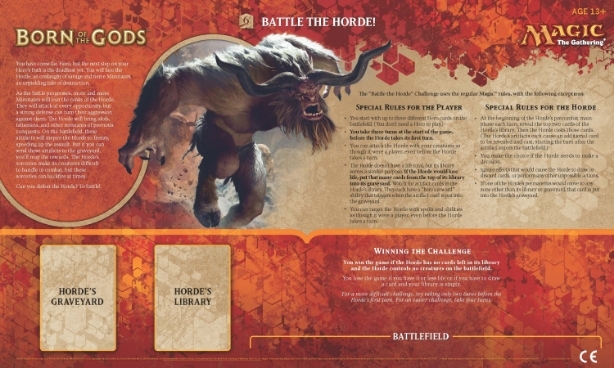 Battle the Horde is a challenge deck that will be used at the Born of the Gods Game Day. It's also the name of the sixth quest of the Hero's Path. 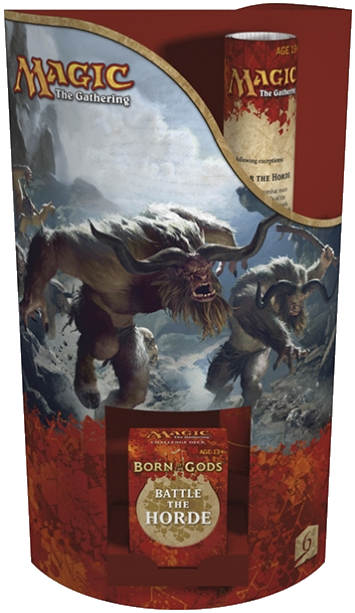 The deck features the rampaging Minotaurs of Theros, as foretold in the Theriad. 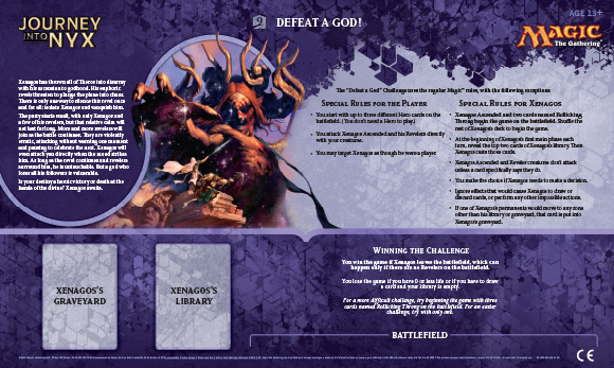 The Challenge Deck is a special self-running deck with its own set of rules, which are printed on the Game Day vinyl playmat. A paper copy of the playmat is included with each Challenge Deck. The 60 card deck contains 15 different cards, which for the first times include artifacts. Defeat a God is a challenge deck that was used at the Journey into Nyx Game Day. The deck features the revelling Satyrs of Theros, and the ascended Xenagos. The Challenge Deck is a special self-running deck with its own set of rules, which are printed on the Game Day vinyl playmat. 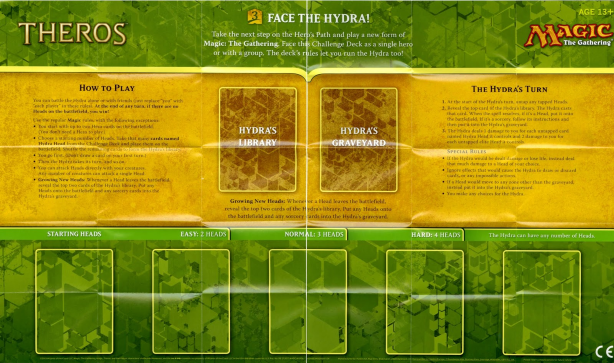 A paper copy of the playmat is included with each Challenge Deck. The 60 card deck contains 15 different cards, which for the first times include enchantments. The God may be battled with the customized "Godslayer" forged by the player in step #7 of the Hero's Path.